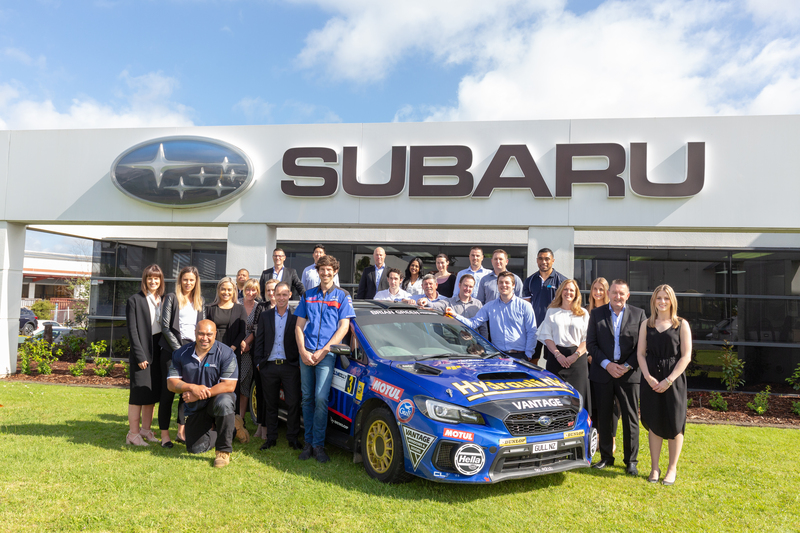 Subaru brand ambassador Ben Hunt officially receives the keys to his Subaru WRX STI from the Subaru of New Zealand team. Ben Hunt and his Subaru WRX STI competing at the International Rally of Whangarei in 2018. Subaru brand ambassador Ben Hunt is now the official owner of the purpose-built Subaru WRX STI rally car. Subaru of New Zealand gifted ownership to him after three years in this production-based model. Subaru have been sponsoring Hunt since the end of 2013. In recognition of his rallying talents, he was taken on as a brand ambassador in 2015. The company offered him the use of a brand-new production model Subaru WRX STI, which he had converted to a rally car. His Hunt Motorsports team, alongside Speedhub Motorsport, spent countless hours transforming the Subaru WRX STI into a rally-fit machine. Now, three years later as part of the agreement, Subaru is handing over its keys. Subaru of New Zealand Managing Director Wallis Dumper says it was a well-deserved transaction. “We were thrilled to see Ben finish second in the 2018 New Zealand Rally Championship (NZRC), behind WRC driver Hayden Paddon. While in 2017, Ben and his long-term co-driver Tony Rawstorn helped Subaru win the NZRC’s Manufacturer’s Trophy, finishing as the third team overall in the process. Their continued success keeps Subaru’s rally heritage alive and we are happy to now be officially handing the keys over to Ben,” Mr Dumper says. Hunt was thrilled to formally take possession of his Subaru WRX STI. “Ever since I was a kid, my rallying heroes were Subaru drivers Colin McRae and Possum Bourne, and it is amazing to be now competing with the Subaru brand, which is truly where my heart is,” Hunt adds. He will continue as a Subaru brand ambassador this year and will campaign the Subaru WRX STI in this year’s six-round NZRC. Hunt will be looking to repeat his 2015 win, which he achieved in an older model Subaru WRX. Hunt has an impressive rally career history, which was jump-started in 2009, when he won the inaugural Rally New Zealand Rising Stars scholarship. He followed that achievement up with two national 2WD titles and a junior championship trophy in 2011 and 2012. Stepping up to an All-Wheel Drive vehicle in 2013, Hunt purchased the ex-Emma Gilmour Subaru WRX and finished fourth in the NZRC. The next year he moved up to second overall. “I’ve been rallying Subarus for six years now and have had many rally wins and podiums in them. Tony and I look forward to doing our best to put the Subaru WRX STI back on the NZRC’s winner’s trophy next year,” Hunt says.